The second season of Marvel Netflix Luke Cage, sees the hero of Harlem struggling to come to terms with his role and position within the iconic New York neighbourhood. Plagued by fame and strapped for cash, Cage (Mike Colter) sees a multitude of problems coming his way, not the least of which is former council woman Mariah Dillard (Alfre Woodard) and her criminal associate Shades’ (Theo Rossi) attempts to consolidate power. The situation is further complicated when the new head of the Jamaican gangs, “Bushmaster” (Mustafa Shakir), seeks to settle an old debt with “Black Mariah” only for Cage to find out he’s as strong and as tough as him. 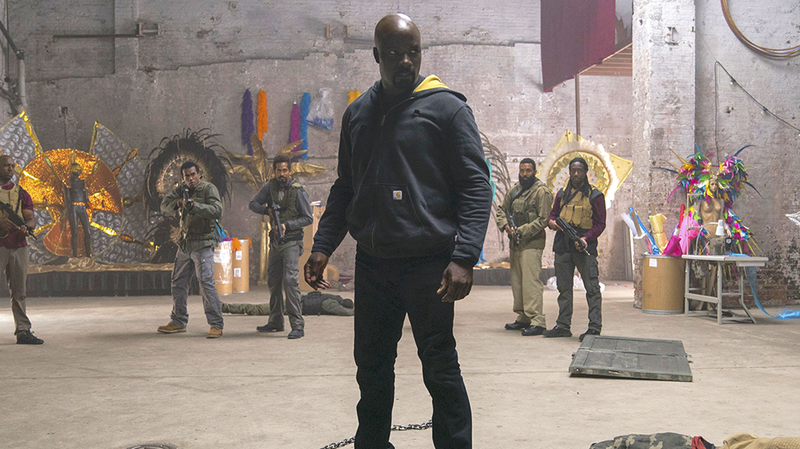 For most of season two, the character of Luke Cage is poorly served by the very show that bares his name. There is a lot more development of the minor characters or the protagonist, and any character development Cage does get is on the whole underbaked. Maria, Shades, and Misty Knight (Simone Missick) are all better served by the initial episodes of this season. By comparison, Cage’s motivation is lacking and despite a strong performance by Colter (really, he’s ideal for the role), many of the character’s actions seem unformed or even contrary to established character. I say for the most-part, because unlike almost every other Marvel Netflix series Luke Cage ends off a damn sight stronger than it starts. The first half flags significantly, and there are a few themes that fans of Daredevil, Jessica Jones, Iron Fist or The Punisher will find overly familiar. However in the final three episodes, that quality improves markedly. By They Reminisce Over You, the storytelling moves with both a speed and decisiveness that we have rarely seen from this stable of series. That last episode upends much that has gone previously granting us a genuine interest and desire to see what happens next. Which means that Luke Cage has a similar problem to a couple of second seasons this year (Riverdale springs readily to mind), in that it is better as a building point for the show, rather than a season in it’s own right. However it still manages to do a number of interesting things in the way that it addresses various factors of Black identity in the American landscape, as well as prejudice and inequality. Season two also has at its core, the tenuous allure of power, and the corrupting influence it has (a theme season one was very upfront with, and one that will certainly be explored in season three). It hits all the notes it needs to, throwing in the collection of comic references you would expect from a Marvel Netflix series (the Daughters of the Dragon reference being particularly sweet). At the end of the day though, this is more a place holder than compelling TV in its own right, but it does have its moments.